(AP) -- Years ago, Comcast Corp. CEO Brian Roberts was asked at a conference what kept him awake at night. His answer: A new technology that would severely hurt the cable TV business. His fears haven't come to fruition yet. But the growing popularity of watching shows, movies and other content streamed over the Internet or over cell phone networks make the cable pipe less important for video than it ever has been in the history of the business. Now Comcast is in talks with General Electric Co. to take a 51 percent stake in NBC Universal. The nation's largest cable operator is expected to pay $4 billion to $6 billion in cash, merge its cable networks into a spun-off NBC Universal and help shoulder $10 billion to $12 billion of debt at the new company. By owning the content itself - NBC Universal's assets include the NBC network, movie studios and several cable channels - Comcast stands to make money no matter where a show is viewed. Such leverage is welcome at a time when cable is losing basic cable subscribers to competitors and growth is slowing at its Internet and phone businesses. Meanwhile, fees it pays to programmers such as NBC Universal continue to climb. "This is about the future of content distribution," said James McQuivey, media analyst at Forrester Research. "It's going to be different. It's going to be multiplatform." On Friday, Comcast's hand in the deal strengthened when Time Warner Inc.'s CEO, Jeff Bewkes, said at a conference in Washington, D.C., that he's not interested in NBC Universal. Time Warner is already whittling the slate of films it puts out each year. Time Warner, which owns HBO, CNN and other cable networks, could have a better fit with NBC Universal's cable networks, but Time Warner says it's not interested in those assets either. Speaking to reporters in India on Friday, GE chief executive Jeffrey Immelt said that "discussions are ongoing" over GE's plans for NBC. Immelt said those discussions include an initial public offering or "other partnerships," but he did not specifically mention reports of the Comcast talks. With control of NBC Universal, Comcast will have a big say in the future of online video. Hulu.com, a popular free video streaming site, is jointly owned by NBC Universal. Comcast is in trials to bring cable TV shows to the Internet free to subscribers. With NBC Universal, Comcast would make money from programming fees it would charge cable and satellite TV operators and phone companies that offer video. It could shorten the time it takes for a movie to land in video on demand. Moreover, Comcast would not have to pay NBC for content. "It gives them an opportunity to shape the digital future," said Chris Marangi, an analyst at Gabelli & Co., a Comcast shareholder. But investors have mixed feelings about the deal. As two days of falling stock prices attest, they are skittish that a run for NBC Universal is Walt Disney Co. redux. Five years ago, Comcast made a failed $54 billion hostile bid for Disney. Since then, Comcast has made no secret that it still wants content. Barclays Capital analyst Vijay Jayant doesn't see the deal as a good use of capital. He said investors viewed Comcast's bid as "empire building," and they don't see any synergies with this purchase, such as improved efficiencies or cost savings. 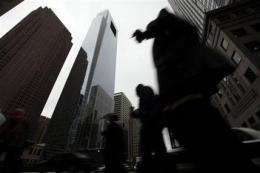 Shares of Philadelphia-based Comcast fell 43 cents, or 2.7 percent, to end Friday at $15.24. The stock fell over 7 percent on Thursday. But others see an opportunity by Comcast to grab valuable NBC programming at a price that's manageable for the cable operator. Wells Fargo analyst Marci Ryvicker upgraded Comcast to "outperform" from "marketperform." Her reasoning: Comcast isn't issuing stock to buy NBC Universal, thereby not diluting the holdings of existing shareholders. The entertainment company also gives Comcast another avenue of growth, she said. To be sure, Comcast is adding content to its cable TV business soon after Time Warner Inc. found it more feasible to separate from its cable operations, Time Warner Cable Inc.
Comcast also will inherit the ratings and advertising struggles at the NBC network, a business model in decline. Analysts say there's bound to be intense regulatory scrutiny that might force an arms-length relationship between Comcast and NBC Universal. But Robert Routh, director at Wedge Partners who follows cable, media and entertainment industries, said Comcast actually will be separating its cable and content assets. Comcast is contributing its cable networks, including E!, Style and Versus, to the spun-off NBC Universal. The cable business will stay with Comcast. Such a separation would unlock the value of Comcast's cable networks, which isn't being reflected in its stock price. "It's actually quite brilliant," Routh said.